Celebrating the end of my pattern hiatus! I’m feeling pretty happy about getting my patterns in better order, and I’d like to share a little bit of that happiness with you. For the next month, I’m offering a coupon good for $1 off any of my patterns on Ravelry. And yes, that means you can get the Paper Snowflake for free. The three patterns the coupon is good for include Ellerbe Mitts, Paper Snowflake, and Pinion. I hope to start a knitalong sometime soon. Keep an eye out on my Google+ page or on my Ravelry group to find out more. The text is much the same. I’m in the process of reformatting all my patterns to be consistent with each other. In the case of Pinion, I’ve also updated the chart from the old Excel chart to a professionally-done chart using StitchMastery. 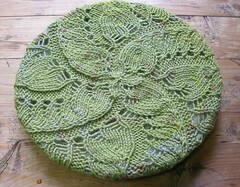 This lacy tam is worked from the center outwards. The design spirals outward and flows into a ribbed brim. It looks more complicated than it is–if you know how to knit in the round, purl, knit two together, knit three together, make a yarn over, and bind off, you can make this hat. Both charts and written out instructions (in abbreviations) are provided, along with suggestions for modifying the brim size to fit. Other materials required include a darning needle for working in ends, about a yard of smooth, thin yarn for making a lifeline, and a plate for blocking (about 10 inches or 25cm in diameter). You shouldn’t need a Ravelry account to . More information is available on the pattern’s page on Ravelry. You might have noticed that it’s a new year. So did I. Anyway, I’ve decided to start selling my designs again this year, and so here I am with my Ellerbe Mitts pattern. Warm mitts, suitable for handspun or commercial yarn. Ellerbe Creek runs near where I live in Durham, North Carolina. I love going for walks by the creek and will donate ten percent of my proceeds from these mitts to the Ellerbe Creek Watershed Association. The mitts are knit from the top down (from fingers to wrist). Most of the knitting is plain stockinette, with a motif from Barbara Walker’s Second Treasury: Cornflower stitch. The motif makes a vertical stripe down the back of the hand and also decorates the thumb gusset. It resembles embroidery, but is actually elongated stitches pulled over the surface of the knitting. To enhance the effect, I recommend solid colored yarn, variegated yarn, or deliberately creating stripes using multiple different yarns. Medium: hand portion is 7.2 inches (18.25cm) around and the cuff is 6.5 inches (16.25cm). For this project, I would recommend treating the first mitt as a swatch; if it doesn’t work out, it’s not all that much knitting to redo it. ~50 yards of DK (or light worsted weight yarn). 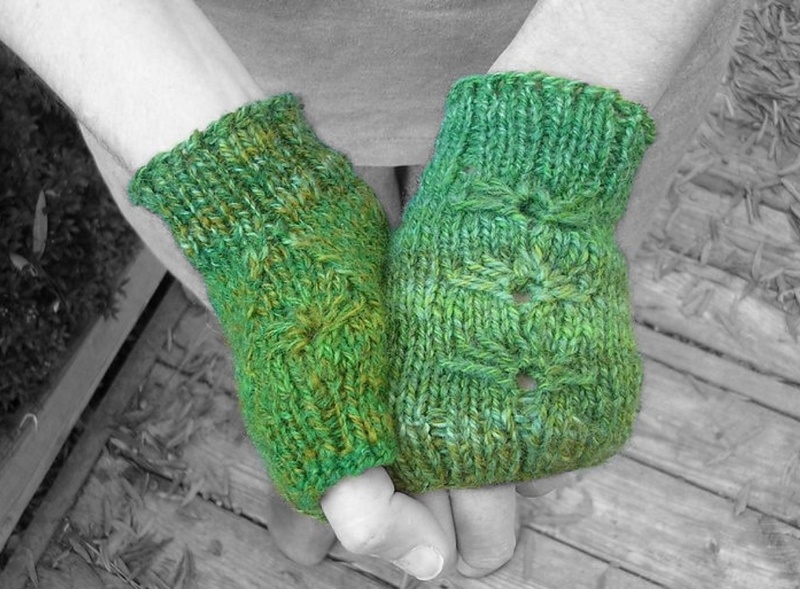 I used handspun yarn to design the mitts. Size 7 needles (double points or circulars, depending on your preferred method) or the correct size to achieve gauge; also a spare knitting needle of similar size (it doesn’t have to match). You need to know how to cast on, bind off, knit, purl, yarn over, slip stitches, decrease, and knit in the round. The instructions are not written for any particular method of knitting in the round – you choose how to arrange the stitches for double pointed needles, Magic Loop, or two circulars. I provide both written instructions and a chart for the stitch pattern. I posted this pattern last year, and will be donating any proceeds from December 2010 to help a friend’s friend and his family make it through a personal disaster: he was caught in random violence and needs reconstructive surgery. This lacy tam is worked from the center outwards. The design spirals outward and flows into a ribbed brim. It looks more complicated than it is–if you know how to knit in the round, purl, knit two together, knit three together, and make a yarn over, you can make this hat. You shouldn’t need a Ravelry account to . If you have a Ravelry account, here’s the pattern page for Pinion. I will donate all proceeds for Haiti Relief (after PayPal fees are deducted) from sales of this pattern through the last day of February. Money will be split evenly between Doctors Without Borders/MSF, Partners in Health, and the Haiti Emergency Relief Fund. Thank you very much for your help!